Back at Photokina in September, Fujifilm took the wraps off of its new mirrorless medium-format camera, the GFX 50S. Today they're released all of the details, including price and ship date. The GFX 50S uses a 51.4MP 'Fujifilm G Format' medium-format sensor (43.8 x 32.9mm), which is 1.7x the area of a full-frame sensor. The lens mount is known as G-mount and, like all medium-format cameras, it has a 'reverse' crop factor of 0.79x, so that new 63mm F2.8 lens is equivalent to 50mm. The camera has a 117-point contrast-detect AF system, and users can set the focus point using the touchscreen or a joystick on the rear plate. Its NP-T125 lithium-ion battery is rated for 400 shots on a single charge (meaning you'll probably get many more in most real-world usage). The weather-sealed body is made of a magnesium alloy and weighs just 825g/43oz with battery and memory card installed. It has a 3.2" dual-tilt touchscreen LCD display and a 2.36M-dot OLED viewfinder, to which you can add a 'tilt adapter' allowing it to tilt upward by 90° and rotated left or right by 45° (that's a lot of tilting). On the top plate is a 1.28" LCD which displays current shooting settings. There are two SD card slots, both of which support high-speed UHS-II media. The GFX 50S has Fujifilm's Film Simulation modes, including a new Color Chrome Effect option. It can capture Full HD video at up to 30p, with a bit rate of 36 Mbps. As one would expect from a camera in this class, the GFX 50S supports tethered shooting from a PC. Optional accessories include a battery grip, H-Mount adapter for use with classic Fujinon HC lenses and a 'View Camera Adapter G' that lets you use the GFX as a digital back. Along with the GFX come three new lenses, with three more to follow by the end of the year. The initial trio of lenses including a 110mm F2 (equivalent to 87mm), 23mm F4 (18mm equiv.) and 45mm F2.8 (35mm equiv.). The GFX 50S will ship in late February at an MSRP of $6499/£6199. 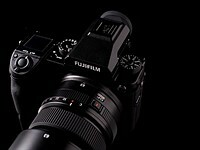 Valhalla, N.Y., January 19, 2017 – As the leader in innovation for photographers, FUJIFILM North America Corporation today announces the FUJIFILM GFX 50S medium format mirrorless digital camera that will launch late February, 2017 with an initial selection of three FUJINON lenses - the GF63mmF2.8 R WR, the GF32-64mmF4 R LM WR, and the GF120mmF4 R LM OIS WR Macro. These lenses encapsulate the design philosophy of FUJINON lenses that are renowned by photographers around the world. 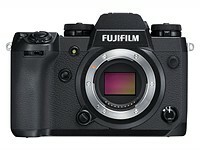 The FUJIFILM GFX 50S uses the X Processor Pro (also used in the X-Pro2 and X-T2 cameras) and allows photographers to use Fujifilm's proprietary Film Simulations with a Medium Format sensor. The camera supports Full HD recording at 29.97p/25p/24p/23.98p. Users can enjoy high quality video with no post-processing required by using Film Simulation modes just like they would with a still image. The GFX 50S introduces a new Color Chrome Effect feature that reproduces subtle tones in highly saturated subjects. H Mount Adapter G – allows you to use SUPER EBC FUJINON HC interchangeable lenses developed for the FUJIFILM GX645AF medium format film camera (discontinued). By attaching this adapter to the GFX 50S, a total of 9 SUPER EBC FUJINON HC interchangeable lenses and 1 tele-converter developed for the GX645AF can be used. While the focusing method will be limited to manual focusing, the lens aperture can be changed using the command dial on the camera body, and shooting with the leaf shutter built in to the lenses is also possible. Using this lens shutter will allow high speed flash synchronization up to a maximum speed of 1/800 sec. RAW FILE CONVERTER EX2.0 – powered by SILKYPIX (free of charge) RAW development software and Adobe® Photoshop® Lightroom® / Adobe® Photoshop® CC (sold separately). RAW development software is used for detailed corrections and advanced image processing that isn't supported by the in-camera RAW conversion. Both software support Fujifilm's "Film Simulation" modes, allowing creation of image data that is extremely close to Fujifilm’s advanced color reproduction. The GFX 50S and FUJINON GF lenses culminate to create a new camera system capable of creating the world's highest level of photographic expressions by combining the thorough incorporation of knowledge regarding camera operation, optical design, image capture, and image processing. I'm very intrigued in this camera but it's really going to cost the house to buy the body and a few lenses. Might rent first. Whileas first Reviews onto the Web with Beta GFX50s (non-final) Cameras writing about very good Image Quality, i am wondering while this great Mirrorless MF Camera does only have a Shutter Life of 150.000 Actuations according to Fujifilm - i do mean, hey, it's (even the cheapest) a Medium Format Camera - even my into Comparsion 2010 tech Nikon DX D7000 does have a Shutterlife of 150.000 clicks - and the Sony A7R Mark II with electronic 1st curtain is raited for 500.000 clicks afaik. I do know that digital MF Users don't make so much shots - neither do i with my into Comparsion cheap LowFi Equipment, but....i do think a camera like this Class should have nowadays at least being a rated Shutterlife for 400.000 to 500.000 Actuations. D800 w/35mm f/1.8 lens: 1305 grams. And for those who say, pedantically - and incorrectly - that it's not medium format: it has the characteristics that define medium format, to wit, greater resolution and dynamic range, shallower depth of field at a given aperture, smoother transition from in focus to out of focus, and, of course, it's larger than 35mm and smaller than large format. The sensor is not small for lowlight IQ, so will FUJI still *inflate* the ISO as always? sour grapes? Are you aware of different ISO Standards? of cause NOT! "sour grapes? ", I do not work for Cankon, but you are working for FUJI? "Are you aware of different ISO Standards?" WOW, do you know what's ISO stands for? Also have you ever used a light meter before? "of cause NOT!" as far as I can see. BTW, FUJI should find a more matured people to come here, but you. With 8256x6192 pixels on a 43.8x32.9mm sensor, I've calculated a pixel density of 188.4 pixels/mm, which falls below my long-held opinion that, ideally, sensors should never exceed a maximum of 200 pixels/mm, lest the cameras suffer an inadequate range of f-Numbers at which diffraction will support true subject detail resolution of 5 lp/mm (in a non-resampled, uncropped, 360 dpi final print from a CMOS sensor, where the RGBG Bayer algorithm and AA filter will reduce a pixel count-implied resolution by 30%), to support a viewing distance as close as 25cm (9.84 inches). For this 51.1MP sensor, at 188.4 pixels/mm, the maximum permissible 5 lp/mm print size is 22.93 x 17.2 inches (great for a 13x19-inch printer, with room for cropping) AND any f-Number up to f/11.1 can be used without concern for diffraction inhibiting 5 lp/mm subject detail. Double the viewing distance from 25cm to 50cm (can you enforce this?) without changing the print size and you can stop down two additional stops for additional DoF - as far as f/22.2 - as the print resolution falls to 2.5 lp/mm, thanks to diffraction, but looks just as detailed from twice the distance. Increase the print size and the viewing distance proportionately (can you enforce this?) and you'll still have to avoid stopping down below f/11.1. Decrease the print size by a factor of two (from 22.93x17.2 to 11.46x8.6 inches), without changing the viewing distance, and you can stop down to f/22.2 for additional DoF, while still delivering subject detail to 5 lp/mm. Reduce your resolution and/or viewing distance requirements and you can make any size print you like. I don't feel sorry, so much, for Phase One or Hasselblad, but the Pentax 645z has almost the exact same specs, in terms of pixel count, sensor size and, thus, pixel density. There's much more to choosing a camera than pixel math can dictate and this FujiFilm offering is busting at the seams with nice features. Pentax must be crying. Maybe overthining. To the last point - they're all using Sony sensors. Pixel count has no effect on diffraction. More pixels resolve more detail than fewer pixels stop-for-stop. Mike - more pixels is not a bad thing . . . better to over-resolve instead of under-resolve. "Pixel count has no effect on diffraction. More pixels resolve more detail than fewer pixels stop-for-stop." This is true when the pixel count is increased while shooting at the same f-Number and maintaining the same viewing distance - without simultaneously increasing the print size. People with 50 MP sensors will, at the very least, be tempted to make larger prints than they would make with like-sized, 20 MP sensors. If they do make larger prints, the Airy disks produced at any given aperture will suffer the same increase in enlargement factor. Thus, as pixel density increases, all else remaining equal, there's no increase in vulnerability to diffraction. (What Great Bustard said...) Nothing I wrote in my original comment contradicts this. Small, high-density sensors can give us the same DoF and diffraction as larger sensors, but with faster shutter speeds at smaller f-Numbers, and thus, confining the photographer to fewer "diffraction-free" f-Numbers from which to choose, of those offered by any given lens. Large, low-density sensors having the same pixel count, can give us the same DoF and diffraction as smaller sensors, but with slower shutter speeds at larger f-Numbers, and thus, more "diffraction-free" f-Numbers from which to choose, of those offered by any given lens. It's the higher enlargement factor required by small, high-density sensors having the same pixel count as larger sensors that forces the use of smaller apertures (larger f-Numbers), and thus, smaller Airy disks at the sensor before magnification, to produce like-sized, like-resolution prints. In the end, neglecting any discussion of SNR or other traits, looking only at the impact had on DoF and diffraction, small sensors can do everything the large sensors can do, but they leave us with fewer diffraction-free f-Numbers from which to choose, forcing us to shoot closer to wide open, which yields faster shutter speeds for a given amount of light and ISO setting. The point is that more smaller pixels do not adversely affect diffraction, all else equal. The blur from fewer larger pixels is greater than the blur from diffraction, stop for stop. In other words, regardless of the aperture or display size of the photo, more smaller pixels will *always* resolve more detail than fewer larger pixels, again, all else equal. We're saying the same thing, and now you are qualifying your statements nicely. It's the higher enlargement factor required by small, high-density sensors having the same pixel count as larger sensors that forces the use of *larger* apertures (*smaller* f-Numbers), *to yield* smaller Airy disks at the sensor before magnification, to produce like-sized, like-resolution prints. Again, the presumption is that the photos are being displayed at the same size and viewed from the same distance, thus the enlargement for a given sensor size (ratio of final image size to sensor size) is identical regardless of the pixel count. So, putting it all together, diffraction is an optical effect, not a sampling effect, and thus has nothing to do with the pixel count. The appearance of diffraction, however, depends on not merely the amount of diffraction, but also the display size and viewing distance (enlargement). The end result is that, stop for stop, more smaller pixels will resolve more detail than fewer larger pixels, all else equal. Thus, sensors with more smaller pixels are not adversely effected by diffraction and do not need wider apertures to "produce like-sized, like-resolution prints" -- they will *always* produce greater resolution photos, again, all else equal. Let me be even more clear with an example: consider two photos of the same scene taken with a 6D (20 MP FF) and a 5Ds (50 MP FF) using the same lens, the same relative aperture, the same exposure time, displayed at the same size, and viewed from the same distance. Whether the photos are taken at f/1.4, f/2.8, f/4, f/5.6, f/8, f/11, f/16, f/22, f/32, or any relative aperture in between, the 5Ds photo will resolve more detail than the 6D photo. You've not stated a print size and viewing distance for your comparison scenario, above. This makes your contention impossible to prove. Really, all you've given us is yet another example of people talking apples and oranges for failure to fully qualify their contentions. I specifically stated same display size and same viewing distance. But what display size and what viewing distance? Doesn't matter. So long as both photos are displayed at the same size and viewed from the same distance (implicit "natural" viewing conditions), the photo made with more smaller pixels will *always* resolve more detail and be no worse the wear for diffraction, stop-for-stop, than the photo made with fewer larger pixels, all else equal. Thanks for stating that, explicitly. It makes misinterpretation less likely. Note the absence of any variable for pixel count or pixel density. We really are in agreement. It only looks as if we aren't when qualifications are omitted or ignored as we try to use the English language to convey scenarios. Same price as leica M10. now which one should we get? decisions, decisions. D810 or 5DS and a bunch of Otuses and a nice trip instead? Saturday, Jan 21, PhotographyBlog has raw samples for download. They mostly sort of extract in RawTherapee. Best of all: If I duct-tape it to my ski helmet, I can use it in place of my GoPro. If GFX a pro camera has a 2-axis tilting screen, there's no reason D900 or 5Dmk5 not to have one too....or at least make 2 versions with one has tilting screen. I am excited by the possibility, but want to see what reality is with this one. DPreview tests hopefully soon. I find their reviews are mostly finantially driven with plenty of old school psychological bias. Also their photographic skills leaves much to be desired. Sometimes they appear technically overzealous by repeatedly drawing references from Dxo literature....Their reviews lacks visual passion and increasingly remains tightly linked to Dxo and Amazon.com. Yeah, there was a recent em2 shoot were the photographer underexposed basically every image a few stops, in the snow! I guess to test their theory they have on "iso invariance"? Needless to say the final results had significantly more noise than one would expect in what was basically good light. Subjective reviews are not reviews... they are just user impression with a lot of bias. If you want to see pretty pictures, you can find it in tons of places. If thats the case Nerd, your not very good at reviewing, and you should do something else. what's the big deal about this size of sensor? if a FF sensor is considered the film size of 24x36, then a 'medium format' sensor would be the film size of 56x56. this new fuji sensor is about 2/3 larger than a FF sensor but still more than 50% smaller than a true medium format size. there are already 50mp FF cameras for less than half of what this fuji costs. what a bunch of lemmings. Too bad the definition of medium format is anything between a 35mm and large formats. As in medium - in between. What else would they call it? Full frame plus? Pure silliness. This sensor is a full APS-H worth of sensor real estate bigger than a full frame. Reviewers of other cameras with this sensor have consistently reported that it produces pixel-level image quality that is head and shoulders better than the image quality produced by current FF image quality champs like the D810 or A7RII. The high MP Canons aren't even worthy of mention in that conversation. Lemmings? Looks like sour grapes in Nevada to me. I refuse to call anything "medium format" unless it's at least 6x4.5 cm. This is just "fuller frame." I want one but that camera is a pain in the a--. Everytime I try to look it up online, my wallet bites me in the behind. They priced the body just under the Pentax. Hopefully with greater sensor volume the price will come down, this is getting close to full frame pricing. I think they'll sell every camera they can build. Where I am at, the 645Z with lens costs 6500, so that would make the 645Z cheaper. That being said, there is no price out yet here for the GFX, so it might tip under the Z after all. Glad to see more competition in the MF marketplace. As someone who finds M4/3 to be plenty for a workhorse, do everything and take it everywhere system, this is looking like my likely next system as an ultimate IQ and damn the portability system for landscape shooting. Hi Mike, I'm saying that for me and my uses, FF is not really worth it as a second system to my filled out M4/3 system, but medium format would be. As someone who is not invested in FF gear, I don't see the benefits of going FF as a second dedicated system for say, landscape and low light applications, but MF is a big enough jump to justify it as a second system to complement what I already have. I agree 100% I also shoot m4/3, and see this as the most logical system that would be worth spending the money on to supplement high end m4/3 gear. Focal plane shutter at 1/125th... well, they will definitely have something to work on for the Mark II version if this makes it past this stage. The shutter speed is 1/4000 and 1/16000, the flash sync is 1/125. The 3 major disadvantages of cameras like these are price, price and price. Some minor disadvantages include the dearth of lenses. Zoom lenses are about as abundant as chicken teeth. The size of the camera and its weight will give you back and shoulder pain if it is carried around all day. The crime rate is such that you need an armed body guard to keep this camera from getting robbed. "The size of the camera and its weight will give you back and shoulder pain if it is carried around all day." What camera are you talking about then? Regardless of IQ 3 fps is a serious limitation for any photographer. Of course it's not. Not for me and many other photographers I'm sure. Cameras are specialised pieces of equipment - there will be a market for this camera without needing high frame rates or high flash synch speed. I think in 13 years of DSLR use I've only used continuous shooting mode a handful of times. "Regardless of IQ 3 fps is a serious limitation for any photographer." Any photographer? Like those landscape photographers trying to nail a shot of that mountain as it flies past the camera? Only if you are shooting birds in flight or sports would 3 fps be a limitation. You need a 600mm lens to shoot birds with this camera. I'm a 3 frames per hour man, myself. If that. I don't think news / sport photography is Fuji's target market for this. It is not a sport camera, 3fps is more than enough. Like the Sigma camera, every photo you take have to wait 1 mins for the camera to process. This is not a camera for the fast shooters. 3 fps a limit for any photographer? There are still photographers using large format cameras, where to get 3 frames per MINUTE you have to be fast like a demon! Mgrum, No it isn't, as at the extremes there are two types of photographer, the "Salmon" which lays thousands of eggs hoping a few will survive, and the Elephant which produces one offspring which is carefully nurtured. The Salmon photographer takes 200 or 300 frames at 10 fps hoping that one will be absolutely spot on for exposure, framing and subject position. The Elephant takes their time and produces one or two images which are correctly exposed, framed and the subject perfectly positioned. The biggest disappointment:::: Flash Sync 1/125 or slower! WTH??! Big slow focal plane shutter, what did you expect? It's the reason a lot of MF cameras (like the new Hasselblad mirrorless) have leaf shutters. They will offer an in-lens shutter. Be patient. "Flash Sync 1/125 or slower! WTH??!" So, the same as the (well regarded) Pentax 645z then. 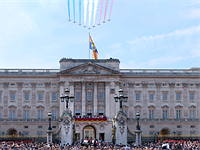 I assume they hope to have a global shutter version available as MK2, so they don't want to base the future on soon to be obsolete tech (leaf shutters). Global shutters that don't come at the price of sensitivity and dynamic range are still a way off, we haven't seen any APS-C sensors of this type, so it will be a while before we see a medium format (CMOS) global shutter sensor. 1/125s is not unusable I think they are just aiming more at landscapers than professional studio fashion photographers who are likely to chose Hasselblad or Phase gear with leaf shutters. Any change there'll be adapters for other lenses like mamiya 645? I'm sure even if Fuji itself does not design such adapters, third party manufacturers will. It has a touch of the Olympus E-1. And weighs about just as much (!). Nice ! They missed an opportunity , if they made this camera only 8MP if would go up to 2 million ISO and daylight pics would still look professional , large pixels is the future . I think the best camera in the world is the Sony A7 SII because of that . Pixel size has very little too do with ISO performance. If you combine the output from 4 pixels into one, you get the same SNR as one pixel 4X bigger. In fact, slightly better. There is less fixed pattern noise in smaller pixels. Sorry, but it just ain't so... you may get 1 more ISO stop, but the SNR is no better at intermediate ISOs. To 57even . Maybe you are not aware of the capabilities and technology of Sony A7 SII and Canon MH20F-SH , groundbreaking sensors both from sony breaking the barrier of sensitivity and darkness . You are talking apples and oranges and your link is meaningless to our conversation. I would like you to explain me in details how they achieve that sensitivity of 4 millions or 400.000. I just added the D810. Still not much difference. @57even: Looking at those graphs, it seems to me that what matters most is whether you're looking at SNR or dynamic range. For high ISO, the A7S II offers a 1 stop advantage in DR over the A7R II, and a good 1.5 stops over the D810 (not sure why you picked that model, but there it is). But the 645Z is already excellent for high ISO shooting, it's not an argument for waiting for the Fuji. Read noise and ADC bit depth places a constraint on DR, and neither of those issues have much to do with pixel size, and a lot to do with pixel design. You can certainly design a sensor for good high ISO performance, but you have to make compromises elsewhere, usually in low ISO performance. But like I said, its not really the SIZE of the pixel that matters except for the fact that you can probably maintain an extra stop of amplification because you have more signal. Here is a good appraisal with excellent images. Is the sensor normal come or X trans? The reason for paying for medium format is mainly flash sync speed. It is 1/125 in this camera but it should be 1/800 like in Hasselblad. You can take better images with Nikon D810 with 1/320 sync speed on a shiny day. It may be written erroneously here but it is the most important property for medium format. If it is true its a great shame for Fuji. I really hope 1/125 is a type-o. That's a big deal. With the fuji X100 you get flash sync at all shutter speeds. By your logic there is no need to by MF at all. endofoto - just get an ND filter if it's for a shiny day. Not ideal, but workable. samhain - replace "type-o" with "typo" and you're there. Agree! It's a deal breaker for true professionals. Not a typo, large sensors give a greater area for the shutter blades to travel, so that limits the flash sync speed for focal plane shutters. Hasselblad X1D-50c has 1/2000 flash sync speed, so that you don't need ND filter on a shiny beach. This is what you need for fashion shoot. 1/250 sync speed is unacceptable for a 6.5 grand camera. Hassy uses leaf shutter lenses - so flash sync at all speeds. This Fuji uses a focal plane shutter - so limited flash sync. Leaf shutter lenses are expensive, the Fuji lenses aren't; so you have a choice. Personally I don't use flash so it's not an issue, but if you're shooting fashion on location then the Hassy is more suitable. I can't agree with you that flash is the "most important property for medium format", it depends on the type of work you do. By the way, the Pentax 645z also has a flash sync of 1/125, and seems to be selling quite well. quietrich, you are right about leaf lenses which are very expensive. I saw today pictures taken with MF Fuji on petapixel, which are like old beautiful paintings, and they are really different, the focus gradation is smoother as they say, I think Fuji just nailed it. I as told with the H adaptor the GFX will be able to use Hassy leaf shutter lenses. It's a solution but a very compromised one! I really don't know why most of DSLR Cameras don't have a good design, a good shape, a sense of innovation. They use same body and model as ten or twenty years ago. Do I like that? As an artist I really hate it. All of these companies should take a look at Hasselblad's cameras to see what's the meaning of product design. I have a question for you. Do you care about the design of your camera? Not really, I care more about the images I make. Cameras are TOOLs. Hammers look like hammers, scissors look like scissors. What's wrong with them? And Hasselbrad 500c was released in 1957 and their design haven't changed for almost 60 years, in case you don't know. "Do you care about the design of your camera"
Of course we care about the design of our cameras. It's to broad and too simple a question. Maybe you're hoping there would be as many different types of cameras to buy as dog breeds? "They use same body and model as ten or twenty years ago." It's a good ergonomic design that just works for what it's intended to do. And human hands haven't changed during those 20 years, either, so no point in making any radical changes. I'm all for innovation that solves actual user problems, but change for the sake of change is meaningless. ".. change for the sake of change is meaningless." About Hasselblad's designs. They made something so simple and so functional, like Apple's product. That's why they don't need to change that much. If you google his cameras and lenses, you'll realize that they change their design. Sorry, guys maybe cause I'm a designer I so much care, and it's not important for real photographers. During the film era, I made the big jump from 35mm to medium format. At that time it was a considerable decision to make..... Much bulkier, much more expensive, slower lenses, etc, etc..... But the image size was 3.5 times bigger than 35mm. 2017 All of the above still applies, except instead of 3 or 4 times the image size, now were looking at 1.7 times. There is no doubt in my mind that this Fuji is a great camera.... but... Will the image quality be superior enough, to justify it over say the new Sony A99 II? It's double the price, and has vastly inferior photo capturing capabilities. What I will say will sound blunt, but everyone thinking this is a "small" MF sensor, with "small" gains in IQ, should rent one and see what they're missing while staying forever with the so called "FF" format. Just remember there's much more happening besides 1.7 times the sensor area. The improvements in SN ratio is only the beginning of the story. Think of better lenses (depending on the case, Leica level glass) , 16 bit files, no AA filter, much more selective CFA. Once you use any 44x33 sensor, you readily see the gains. It's not something you gotta put effort to see. Actually, the gains are "in your face" style. Notice a sensor like this was originally released in a 35k Phase One camera, meant to satisfy the demands and needs of world class photographers like David LaChapelle and Annie Leibovitz. A D810, as good as it is, has always been a lower level product from the very start. For $ 6500, it's tremendously worth it. @KOS by your logic nobody should buy a full frame camera which can run anywhere from 2 to 8 times the cost of an APC camera. Its the lenses you see. You can design a much better F4 or F2.8 lens that gives you the same DOF as a F2 lens on full frame but with far less aberrations. Throw in the massive resolution enhancement and its worth it. Just go the compare tool select the downsized print resolution pic of the 100mp phase 1 against the 810 and look at the sponge. Its night and day. Although you are right the improvement was much more dramatic for film. Nowadays with the quality you can get with digital (and the exponential price to make bigger sensors) the so called full frame takes the spot of what film medium format used to be, and apsc that of normal 35 mm cameras. That's normal that by now those digital medium format occupy a smaller niche than that of film medium format. But in my opinion it will be thanks to those cameras that the prices will come down in the future, alongside increase in sensor size. Sure pick the most expensive Aps-c and the cheapest full frame. Try it with the cheapest of each or with similar performance (autofocus etc). I could also compare the 1DX mk II price to the Fuji and say there's no price difference between full frame and medium format. Although this is beyond my price range, I applaud Fuji's effort to innovate. Those who moan the fact that the sensor is *only* 1.7x the size of FF are missing the point, I think. With this, Fuji has 2 full lines of MILCs: one APC-S and one this. Fuji skipped FF entirely, call it "Super FF" is you wish. It will offer tangible, if not dramatic, benefits over FF and that is a good thing. And indeed this sensor has been used in at least 4 other MF digital cameras. At this price point this camera is a way better value than the new Leicas. Even the 645z was a better value. This camera and the 645z have lots of DR. There's a new Leica MF, when did that come out? Hey, the more you bash Leica the more you prove the "small hands" thing. Okay, fine great, look forward to samples shot with various lenses. Now, will DPR be doing another series of Hasselblad X1D samples, or even a full review, with all 3 lenses represented any time in the next month or two? Yup hopefully if the X1D gets released they can do a comparison. Real world comparisons of these two will be nice. X1D is lighter, 16bit, more expensive, no zoom as yet. Real world focus capabilities and output will be interesting. The X1D has been released in small quantities. I could arrange to rent one, if I really wanted to. These new "small" mirrorless and "inexpensive" MF cameras have my interest. I'm looking forward to real world use by you guys before pulling the trigger. I wasn't aware any of the X1Ds actually shipped. My bad. Very few have shipped. But as far as I know that mostly has to do with the damage to the Sony sensor factory or supply chain. How did it feel and what did you make of user interface. Obviously I'm not asking for a full fledged opinion other than based on the limited time you had it in your hand. I liked the UI, I've tried 3 examples of the camera, as in handled at least 3 bodies including all 3 lenses--starting in the summer of 2016. I think the body and UI design are very good, if a bit different than what most are used to. SOOOOOO if this MF sensor is 1.7X bigger than FF.... does that mean there is a bigger difference between APS-c and FF? than FF and this MF sensor? Yeah, you're missing the entire history of digital MF cameras--up until the 2016 release of the 100MP PhaseOne system. Is this the first time you've read a DPR article on a digital MF camera? You know this isn't a new sensor in this Fuji, this sensor has been in use in the Pentax 645Z for more than 18 months. Phase uses it, so does Hasselblad. Not everyone is versed in "the entire history of digital MF cameras." And I don't see why curiosity about them should be met with assholishness. Because the claim that "it doesn't match the size of 'real' MF film" is boring and tired one. That has been repeated endlessly for years. Yes, I realize the OP didn't exactly say that--so I was harsher than I could have been. Also the fact that this sensor has been used in multiple MF digital bodies didn't help the OP. The OP's "question" included an implicit putdown of MF digitals, it's tiresome for the aforementioned reasons already enumerated. Perhaps, and it is only perhaps, I should have simply said "this is a normal size for an MF sensor, don't go down the road of thinking that FF is 2X as good as APSC either." And yet the Pentax 645Z sells, and people don't say but I can use a Canon 5DSR instead. Sure put a Zeiss on the D810 or the 5DSR and those cameras produce excellent images, as I'm sure will their replacements. You're not likely to see 70MP in a FF sensor any time in the next 3 years. Just look at the price of the 100MP Phase system. The Fuji is not a camera designed for "most photographers." "Most photographers" don't need anything larger than FF, or even APS-C. MF has never been a format for "most photographers." What about leaf shutter lenses? This is a serious instrument. It's the sort of camera that will be in use by their owners for many years to come as they will be very content with the wonderful image quality. It's now Pentax's turn to counter with a 645Z + 24-70mm f2.8 D FA for $6999. I'd also like Pentax to announce a 645Z Mark II that uses a magnesium/carbon-fiber body to shave off a pound or so, plus the inclusion of an AF sensor similar to Nikons 20K Multi-Cam in the D500 and D5. That would really set the MF DSLR apart from the mirrorless X1D and GFX, if it had a high speed wide-area autofocus system. but that lens doesn't cover the 645Z sensor??? Is the Pentax 24-70 f2.8 any different than the Tameron 24-70 f2.8? The Tameron's not very modern or impressive on a Canon or Nikon body. Josh, If Pentax redesigns the existing 645 28-45 f/4.5 lens, or create 645 24-70 f/2.8 lens, you can expect that lens to sell at a price that's more than the camera and noticeably heavier than the current premium zoom lens. Sure I'd like the lens to be faster, but that's just nit picking- for most shooting the lens, it isn't even remotely needed and is probably why Pentax won't bring a faster version to market any time soon. Such a lens would allow many Pentax MF shooters to operate using a two lens kit. the currently imaginary 645 24-70 f/2.8 which you'd need a burro to carry, and a telephoto lens beyond 100mm. So its sensor is only 1.2~1.4X linear size of now-cheap FF cameras, and the fastest lens it has is only f2.8. I remember that's the VERY logic fuji used to argue that "Our system with good and fast lenses is just as good as FF". Isn't the logic working the other way around this time? 99% sure this is a Sony made sensor, from a recent interview they mentioned they chose that sensor size/pixel size/bit rate because it allowed them to scale for future upgrades. They mentioned they were exploring a 100MP version in the future. The fastest planned lens is an F2 Atm. This should be a decent step up from FF in IQ at native print sizes larger than 48" on the long side. It's all about raw resolving power with stopped down lenses. Larger 50 megapixels beat 50 smaller megapixels any time. If you are into low-light photography or a bokeh junkie, go FF. 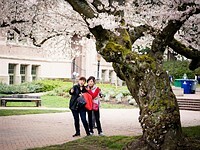 "Isn't it just better to use 40-50MP FF sensor (i.e. sony's excellent 42MP BSI sensor) and sharp 1.4 lenses we already have instead?" Well that depends. Do you want a camera with which you can always be confident that you'll get the shot? If so, medium format definitely isn't for you, and FF cameras are a much better choice. But if your priority is ultimate image quality, knowing that you're imposing significant usability constraints, then no FF camera would be a better choice. Bigger sensors, given equal levels of tech, simply deliver higher quality images; particularly in regards to color depth, dynamic range, and noise. You can't rework the physics. But very few people need ultimate image quality, and most need/want a highly flexible system. So, the question of which system is "better" is only relevant to what you need from the camera. Comparisons with FF rely on lowering the GFX50s's ISO to something like 200 or higher for comparison. Yes, it's not any better once you get off base ISO. In very limited light scenarios you could argue it's worse than the best of (and still a little cheaper) FF. But at base ISO no FF can match it's DR and even at matched resolutions (which most wouldn't) the base ISO sensitivity would be inferior. It's a one trick poney yes, FF is more general, but the MF trick is base ISO resolution/DR and for some that's all that matters. Yes, it requires a lot of light to shoot ISO100 at f16. When you have that light, this is better. "Bigger sensors, given equal levels of tech, simply deliver higher quality images"
Exactly, and 1.3x bigger sensors deliver 1.3 x mute image quality, i.e. not all that much. You are confusing linear difference with area size difference. Is FF 1.5x better than APS-C? No, it's more than 2x "better", because the area is more than 2x larger. Cameracist is 100% correct. But we can break this down a different way that makes the point even better. This camera's sensor is 68.5% larger than a FF. Now, 68.5% larger is meaningless if you're talking about a cell phone sensor. However, in this case that means adding the light gathering ability of an entire APS-H sensor. And it's patently absurd to think that taking a FF sensor, and adding the additional light-gathering area of another APS-H sensor, would only make a marginal difference in image quality. As many a photographer has already testified, the image quality coming out of X1Ds and 645Zs is head and shoulders above anything a D810 produces. It is way beyond "not all that much." There's no reason to think that the Fuji version of the same sensor will be any different. Depends entirely on what your measuring, some things like the extinction resolution depend on the linear size, others depend on the area, really it's somewhere in between. However you measure it, it's a smaller difference than between APS-C and 35mm (which itself is somewhat exaggerated by quality differences between lenses for APS-C (there are some good ones but no Otus equivalent)). Problem is, no-one who drops $12,000 on one of these kits is ever going to admit to themselves that the results are only 60% better, so all you are going to hear for the next 6 months is "OMG the images are amazing, so much better than full frame!!!" "68.5% larger is meaningless if you're talking about a cell phone sensor." Actually it's the opposite, relative differences are what matter in photography in almost every case (I can't think of single counter example right now, absolute resolving power, absolute diffraction disk, all meaningless). 100% more area in a cell phone sensor gives a one-stop advantage in light gathering, same with any other sensor. "And it's patently absurd to think that taking a FF sensor, and adding the additional light-gathering area of another APS-H sensor would only make a marginal difference in image quality"
8x10 film is rarely cut exactly to size. If it's cut just 2mm larger, then you're adding the additional area of another FF sensor. It's patently absurd to think that you could tell the difference between 8x10 film cut exactly and 8x10 film cut 2mm larger or smaller in terms of image quality, despite there being a whole full frame sensor's worth of difference. Clearly we disagree. And we can argue about the theory til the cows come home. But the real proof is in the pictures. And that's where your argument simply falls apart. Reviewers who have put this sensor's image quality (645Z/X1D) up against current FF image quality kings like the D810 and A7RII have consistently said that this sensor's image quality is on a whole different level. The most recent review I read said that the new Fuji's image quality, compared to a 5DS-R, is "basically incomparable." So you can argue all you want that it shouldn't make that much difference. But the actual results say otherwise. "Problem is, no-one who drops $12,000 on one of these kits is ever going to admit to themselves that the results are only 60% better, so all you are going to hear for the next 6 months is "OMG the images are amazing, so much better than full frame!!!"" This argument only holds true for actual purchasers. Professional reviewers rarely purchase the equipment they are reviewing, and their reputation relies on limiting the embellishment. And what are those professional reviewers, with no dog in the fight, actually saying? Simply put, they're saying you're wrong. I don't know Fujifilm used the anti-aliasing filter or not. The sensor is X-Trans or not, and I think it is not. The array is Bayer, not X-trans. You're right about the colour depth, but the price reflects that and I think it's a very reasonable compromise. It's a bayer pattern, 99% sure it's Sony made. From a recent interview they mentioned they chose that sensor size/pixel size/bit rate because it allowed them to scale for future model upgrades. They mentioned they were exploring a 100MP version in the future. @trungthu There are only 2 100MP digital back that has 16bit color with 15 stops DR. All other 50MP cameras/backs only does 14 stops DR, but some use 16bit color in spec sheet, while others only put 14 there. If you look at Phase, their Credo 50 also does 14 bit only. So it is highly possible Pentax and Hasselblad just put 14bit files in 16bit shell. Unless I am mistaken, this camera uses a Bayer pattern? Wonder why they didn't go with X pattern. I think Fuji is outsourcing the manufacturing of the sensor to Sony in an effort to save money, and Sony only makes Bayer sensors. Also, the Bayer has more native compatibility with Photoshop. They may switch to the Trans-X sensor on a second gen model if sales are good enough, though. All sensors that Sony makes including Fuji are agnostic until the the color array is placed over the sensor. Spot on Steelhead3 - in fact all Fuji X ILC cameras are based on Sony sensors, the 16MP ones sharing the same basic sensor that has been used by numerous other cameras including Nikon, Pentax and of course Sony themselves. It's only the filter array on the front that varies. I think I saw quoted somewhere that Fuji reckon this MF sensor has so much resolution anyway that there is precious little advantage in going down the X Trans route - and as others have said, making the raw files easier to edit without endless arguments about which PP software you need to use is probably quite important for the target market. In terms of sensor size, the most accurate comparison is that this sensor is the size of a 'full frame' sensor, with an APS-H sensor added to it. Especially when you consider the impressive capabilities of little 1" or m4/3 sensors, adding the light gathering area equivalent of an APS-H sensor is going to produce a significant jump in image quality. Thus, this is not just a slightly bigger full frame sensor. It's a whole different level of image quality. And that's true for the 645z or the new Hasselblad as well. Any nonsense about this not being true medium format, or it not being appreciably bigger than a full frame sensor, is just that; nonsense. Fuji GFX 50S + adapter + Canon 85L - this is what I'm waiting for ! There's no way the Canon covers the area of this sensor. That would be an amazing lens on an MF if it could cover the whole sensor area. But I think only the fish-eyes and ultra wide angle lenses for full frames will work on this guy. Image circle is at least 35x35mm, I remember that somewhere on MF forum someone mounted it on converted 6x6 camera with interesting results. Fuji sensor is a piece of cake compared to 6x6 film. I don't believe a word of that, no offense. It's an 85MM lens. MAYBE if you stopped it down to F4 the veining to full black would still be only at the absolute corners. 85mm F4 is not that interesting for MF, nor would it offer autofocus. Ming Thein has hinted that Zeiss Otus lenses can cover a larger than 35mm circle. Perhaps large enough for this 50mp sony sensor class. Given the IQ, weight and width of Otus lenses compared to other excellent lenses of the same FL, one wonders if indeed this is true. Canon Tilt-Shift lenses should cover the frame. 24mm II TS-E has an image circle of 63mm and as a tilt shift lens is very good across the frame. Do they make any adapters for Pentax DFA645 or DFA67 lenses? They'll have no trouble covering the sensor. (esp. the 67s) You'd still be hitting the 'sweet spot' of those lenses. FF lenses SHOULD cover image circle larger than 35mm film size other their edge performance will be utter horrible. @nerd2: In no way is that a given - some lenses are deliberately baffled to reduce internal reflections, or as a side effect of saving space. Would like very much to try this new GFX! A lot of bitching here along the lines of "it's not proper medium format". I may be wrong but I don't remember the same volume of harumph about the X1D or 645Z which both offer the same sized sensor. I'm definitely in the market for a new digital MF this year, so will be looking at this Fuji once they release the 45mm lens. I prefer the knobs and dials interface over the iphone-type operation of the X1D. The Pentax on the other hand offers a lovely OVF (which I much prefer), and more lenses to choose from - but is that enough to compensate for the bulk and the camera shake from that massive mirror? Looking forward to finding out. One thing's for sure, Fuji have a long and respected history of innovation in the MF camera market; and it's gratifying to see that continued with this GFX. mosc, I own a Mamiya 7ii, which produces 6x7cm negs that are almost twice the size of the Bronica 645 I previously owned, but less than half the size of the Fuji GX617. All three cameras have been happily labelled 'medium format' for many years. I just don't see the problem. There was just as much complaining when the Pentax 645z was released vs the Canon 5dsr. The Pentax 645d vs the Nikon d800E. People will never stop complaining but I bet if given a choice to own one, they will pick the medium format camera EVERY time. Nobody refers to 1/2.33" to 35mm as "small format". The term "medium format" is just too damn vague. People who say this is not medium format are just being trolls but there is a point that medium format itself is such a vague term as to tell you very little other than "it's bigger than 35mm". Yes it is, but how much bigger and how does it compare to other sensors that are bigger (it's not the only one). Some simplistic size terms like we have for APS-C and APS-H etc would help. mosc..."Medium Format" is no more vague than the term "sports car". If I need to know what performance, maintenance or interior appointment advantages a Porsche 911 Turbo S has over a Ferrari 488, I can delve into it. However I'm not all the sudden dumbstruck because someone says "sporting car". @mosc: Except the Germans who have it right and call it Kleinbildformat = small image format. 1. One who despises, ignores, or is patronizing to those he or she considers inferior. 2. One who is convinced of his or her superiority in matters of taste or intellect. Not to worry, the DC situation will quit getting worse starting tomorrow. No, it really won't. And the fact that you believe it will proves that you are a gullible tool. Sorry, but it's time to start punishing stupidity, and I have to start somewhere so it might as well be you. I'm impressed that you have taken on the daunting task of vanquishing stupidity from those who a less gifted with foresight and wisdom than yourself. What slays me is that those of your persuasion tout themselves as being compassionate, open minded, non-judgemental, etc., etc., and yet you are the first to start calling names, labeling people, judging those you don't even know, and belittling anyone who disagrees with you. Good luck with that more intelligent behavior and attitude. Feel free to mete out the punishment I so clearly deserve. Meanwhile, I'm smiling today and will be smiling tomorrow. Now, since none of this has anything to do with the Fuji announcement, I am done with this silliness. I find it amazing that apparently the only reason to buy MF would be "greater depth of field" and that some people here are only arguing over the "slow lenses". I've had the opportunity to try out an X1D and found the image quality to be shockingly better than what I got from my trusty D800. Detail, tonal range, dynamic range, colour accuracy, sharpness were all in a different class. This camera has the same sensor so it will likely produce equally amazing images. Image quality is about more than DOF. This camera (and the X1D) make some sacrifices in speed and size to offer better image quality. If that's what you need, then be grateful that there are now a few affordable options one tier over Canikon/Sony in terms of IQ. If this is not what you need, then be grateful that this innovation will help squeeze out more innovation from competitors in the future. Man I hate being such a fanboy, but I really love Fuji as a company. They've done everything to bring me back into actually enjoying taking pictures again. I'm not in the market for this (I'm looking at you X-T2), but this kind of stuff is so exciting. Let the medium format games begin! This will shake things up. For the battle-scarred pros among us, the press release appropriately beckons from Valhalla (NY). It seems that DPR is a great place to lose perspective. Until very recently, the vast bulk of sensors for the classic MF cameras were all smaller than 645 film(which itself was frequently sneered at by 6x6 and 6x7 users). "Way too much money" The Nikon D5 $6500 the Canon 1Dxmk2 is $6000. Premium lenses in both their lines sell for $1500 and up. Fuji, Pentax, Canon and Nikon are very cognizant of who is buying those cameras and they know the bulk are amateurs. They also know that the bulk of amateurs shoot landscapes (many with cats) or scenes not requiring extreme lenses. They also know that pros using or aspiring to MF are, for the most part, not looking for extreme lenses. Thus the stars align for the GFX and the 645z and X1-D. While many will squawk at the price/features and make comparisons to other cameras that buttress their position, Fuji and Hasselblad will work furiously to meet demand and reduce the waiting lists. It's so funny how many FF users need to justify their system choice be trying to put down other systems. MFT and APS-C? Too small! Low light capabilities not good enough! Not what serious shooters use! Medium format? Not worth it! The lenses aren't as fast! The sensors not that much bigger! I understand the FF is a great sweet spot (I used to shoot it myself but switched from a D750 to an X-T2 because it fit my needs better) however every system has pros and cons and different things aren't bad. M43 beats both these formats easily! Case closed! We really shouldn't be calling these medium format. How about a new designation: SMF ? Agreed, FF should be 35mm or something. The MF-S, MF-M and MF-L for the different sizes of Medium Format. Because Fuji calling this sensor MF size is an exaggeration. DamianFL, yes.. we should call it MF because that's exactly what it is. You don't not call a pickup truck a truck because it's smaller than a dump truck. Some of you need to stop being ridiculous. If you want a bigger sensor, then great, whip out $40 grand and enjoy a larger sensor. If you only need 44x33 or (Leica size) and reap the benefit of noticeably more cropping room, better colour, and greater colour range (DR), fast sync (depending on camera), etc... then spend your $10k and go with that. The bottom line is they're all medium format cameras. We don't need but another designation to denote what's already been long defined. Actually in my country we call what Americans call trucks, ute's (utilities). Trucks are of a certain size. This is what MF should be, MF-S, MF-M, MF-L so we the consumer know the difference between a GFX with a tiny sensor and a 645 with a significantly larger sensor. It just makes sense to do that, don't you think? MF is MF, there isn't a need to change a thing. Just look at the sensor size of each camera just as you note the engine particulars of an automobile if you're in the market for one. People need to stop making up definitions for that which is already defined. I think it would be most informative if the two main aspects of the sensor were cited: pixel area 50Mpx and physical dimensions 44x33 (rounded). That's much more useful than outdated generic terms based on film sizes.